Against the Brewers this week, Javier Baez recorded four hits (including a double), plus a walk, three stolen bases, and two runs scored over three games. After a pretty rough hitless stretch there at the beginning of June, it certainly wasn’t the worst series in the world, at least not with those results. However, Baez also struck out five times in those 12 plate appearances, underscoring the many-sided nature of everything he is/does at the plate. And that sorta leads to the question … what is going on with him at the plate lately? 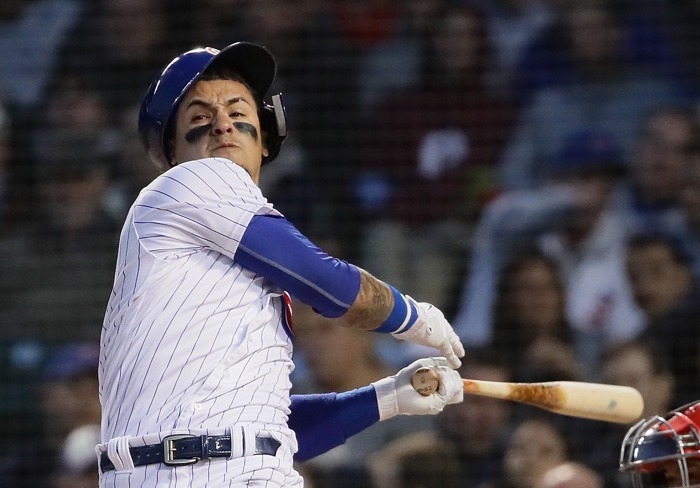 After a burning-hot start to the season (148 wRC+ in 108 March/April plate appearances), Baez slowed way down in May (103 wRC+ in 106 May PAs), before screeching to a halt here in June (17 wRC+ in 38 June PAs) and I think I know why: the strike zone (gasp! what a shocker). 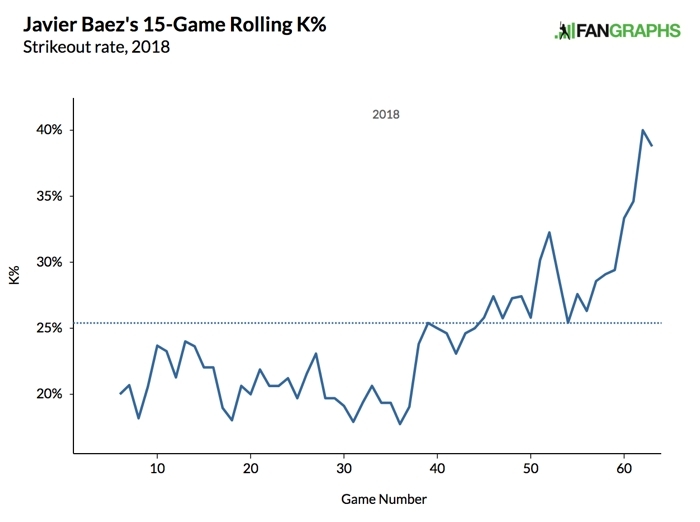 Baez’s rolling 15-game strikeout rate shows that his early season restraint and contact has all but evaporated, as he’s slumped to a near-40% strikeout rate here in the month of June. So what’s changed for him? Well … quite a bit, I’m afraid. Let’s look at his plate discipline stats to see whats up. For the first month of the season (which includes the three games March), Baez was swinging at 44.3% of pitches out of the zone, which was more or less in line with his career rate. Since then, however, his O-swing rate has jumped to over 50%. He’s still swinging at as many pitches in the zone as ever, but he’s offering at FAR more out of the zone since May 1 and that’s really not great. Sadly, it’s also not all. Even though we’d all love to see his O-swing rate return to that early-season 44.3% form, it’s not like that’s a great number, right? League average in 2018 is 30.2%, so 44.3% is still ridiculously high, and, as a matter of fact, Javy’s 47.9% O-swing rate this season is the worst in baseball by *over 3 percentage points*. That is just nuts. And here’s the other thing. Earlier in the year, when Baez was swinging at pitches out of the zone, he was making contact with them 58.7% of the time. Now, however, that number has dropped down to 54.6%. In many cases, you don’t love to see higher o-contact rates because that tends to lead to more weak contact, but it has almost certainly hurt his strikeout issues. Moreover, when he’s making good contact, Baez often makes good contact even with pitches out of the zone. It’s not entirely bad news though. Baez has actually lowered his first-pitch strike rate a tiny bit since the beginning of May and has certainly made a LOT more contact on pitches in the zone now (84.1%) than he did during the first month of the season (77.9%). Now, that could just mean he’s swinging way more often in general (and his swing rate is up about 3 percentage points), but combined with much less contact on pitches out of the zone, he’s actually been able to lower his soft-hit rate from a pretty bad 23.7% to a roughly league average 18.8%. That’s a win there – even if it wasn’t entirely purposeful. On top of that, Baez’s infield fly ball rate (a loose indicator of poor contact when elevated) has actually fallen from 16.0% in that “hot stretch” to just 9.4% now. And that’s really not ignorable, it’s a pretty good sign. Unfortunately (this is a real roller coaster, isn’t it?) his line drive rate has plummeted and his ground ball rate has skyrocketed from period 1 to period 2 … so the performance has all been a bit of jumbled mess, and Baez’s slash line is taking a beating for it. At this point, I’m not even sure if I’m confident saying he was actually that much better at the beginning of the year (i.e. his underlying performance, not his results). Sure, some advanced stats looked better, and his worst stuff was, you know, less worse, but I’m willing to bet a fair bit of luck went into that hot start and it’s all beginning to catch up to him, just in different ways. To that end, no, I can’t say I know where Baez’s season is going from here, but I do know that I am happy to see him make more contact on pitches in the zone, because when he does, he usually crushes them. However, as long as his contact rate on pitches out of the zone is so high, he’s going to make plenty of weak contact, too (and that goes double for the raw count of soft balls in play given that he offers at more pitches out of the zone than anyone in the game). And as for the strikeout rate, well, Baez has shown he can keep it under control for long enough period of time, but he’s clearly outside himself right now. Until he can show opposing pitchers that he won’t chase pitches out of the zone so much worse than anyone else in the game, he and his slash line are going to suffer in between little bursts of life.